When I heard there was a Grill available with 580 inches of cooking space for just over 120 dollars I asked what was wrong with it. I meant that there must be some sort of catch to sell so cheap and provide so much space. And upon closer inspection, I found out what the catch was. In fact, I’ll be describing all of the strengths and weaknesses here so that you get a real idea of what you might be buying. Instead of the picture, the manufacturer wants you to see. I’ll give you a little hint. It’ll be the best grill in the world for some people, but others will want to steer clear. Ok, I’ll tantalize you no more. Let’s get straight down to the details. This is the auspicious Char-Broil Charcoal Grill, 580 Square Inch Review. It’s a substantial size at 28 Inches by 43 Inches by 47 Inches. 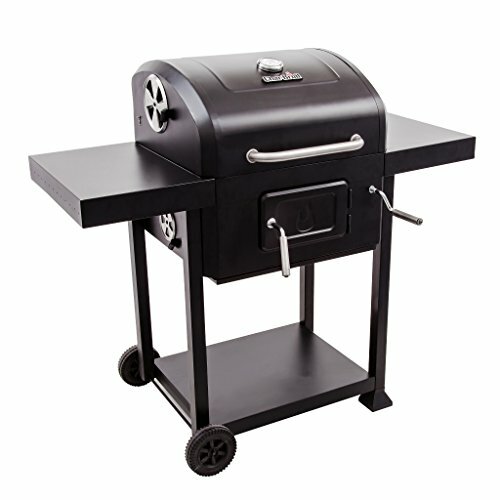 This makes it one of the largest Grills you can get for around 120 dollars. The design is also very nice looking with its clean black finish and sleek Side Shelves. The Cart is basic but you do get room underneath the primary cooking space for supplies. It’s not a large space underneath but it is enough for any meats you have waiting to go on the grill. You also might want to leave any Grill Accessory’s you have here. On top of the Cart, you have your Grill Top, Lid, Side Shelves, and Fire Door. I’ll talk more about these later, so sticking to the design subject this has all the inclusions you need. Apart from maybe great Wheels. The Wheels are pretty flimsy and so it’s difficult to push along, but at 68 pounds you’re not exactly pushing a giant rock up a mountain either. It seems impossibly good for the price and the good news continues with the Grates. You get some fantastically good Cast-iron Grates of a nice thickness that will retain and spread out heat at a rapid pace. It makes for fast cook times and most importantly, it makes for meats without burnt patches or uneven results. At this point, I was wondering if this was all too good to be true. It works the same as Hinged Grates do. You open the small door on the front of the Grill just beneath the cooking area, and shovel in those coals. You can also tend to the coals you already have in there while you’re cooking. The door is very easy to open and you can do it with one hand while you’re Grilling. Here’s a catch. It’s made out of pretty cheap materials. The weight of the entire thing is only 68 pounds so we’re talking lightweight Steel. You gotta think that this will last 3 to 5 years max. It’s noticeable from the first time you see it that one certainly couldn’t call this Heavy Duty and it’s apparent that the strategy was to cut costs on materials. Now you know how they got the costs down so low for what is an outstanding grill in every department but construction, does it still appeal to you? As I said in the introduction, this will polarize opinion. some will want a long -term cooking kit, so won’t be interested. Other’s will still think it’s great value at the price. It’s Porcelain-Enameled and cheaper Metals are usually easier to clean anyway. All you do is take a wash rag and wet it a little. Then lightly scrub. Use warm water and you should be able to get all the dirt off very quickly. Cleaning is helped along further by the Pull-Out Ash Drawer. One thing I haven’t seen mentioned either in other online reviews or Char-Broils own product descriptions is the large Dampers. These really are excellent and allow for a high degree of smoke and air control. It’s definitely possible to use this as a Smoker although it’s not advertised as a combination Grill. It’s a great Grill. So, it all comes down to how long you were thinking of owning a Grill for, before buying a new one. If you’re good with 3-5 nice years of spacial Grilling then this is for you. It’s only 120 bucks and it’s got 580 square inches worth of cooking space, along with excellent Dampers, Terrific Grates, and an easy to clean surface. You can cook on it and you can smoke on it. It’s very versatile. If however, you want a Grill that’ll still be with you in ten years then you’re not going to want this. The materials they used to get the price down just won’t last that long. So how long do you want it for? Thank you for reading.